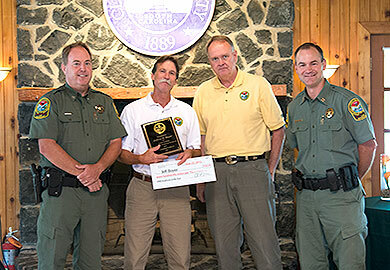 The S.C. Department of Natural Resources (DNR) recently recognized Shooting Range Coordinator Jeff Boyer of Eastover as the 2014 Employee of the Year. Jeff is the kind of employee that is constantly working on solutions, even in areas where DNR was not required to be involved. For example, during the Palmetto Shooting Complex project at the National Wild Turkey Federation (NWTF), Jeff offered his assistance in all areas of the project. For example, his extensive knowledge of water systems and water runoff are invaluable tools that he can offer range partners. Jeff’s knowledge of construction and site prep are invaluable tools that assist with every aspect of the range building process. He is well versed in CAD systems as well as surveying. The range plans that DNR uses today are the result of Jeff’s personal CAD work and his coordination with a state approved engineering firm to create a range blueprint that can be adjusted to meet any footprint required. His range design and engineering expertise has resulted in hundreds of thousands in cost savings for the Department in design and consulting fees. In fact, other states have requested to use the design layout that Jeff created. Jeff was also responsible for the addition of a pistol range at the Spartanburg Range. He designed a complete pistol range to fit in a small footprint between the existing rifle ranges. This was no small feat, and the result has been an increase in monthly range participation by nearly 75%. Jeff has been directly responsible for the creation of three new ranges to date: Belfast Range in Laurens County, Marsh Shotgun Range in Marion County, and the Palmetto Shooting Complex at the NWTF in Edgefield. He was also responsible for the addition of the pistol range at the James O. Thomason Range in Spartanburg County. All of these have served the public by expanding recreational shooting opportunity for the public and citizens of South Carolina. Jeff continues to serve the public by seeking new partnerships with local and federal government bodies to increase range opportunities across our state. He is currently working with the US Forest Service to complete a major upgrade to the Twin Ponds Range on the Francis Marion National Forest. This will serve the Charleston area and surrounding community. In addition, Jeff is currently working with Horry, Kershaw, and Dorchester Counties to locate suitable sites to create ranges for public shooting access. One of the major goals of Hunter Education in every state is to teach Hunter Education courses. The secondary goal is to create areas for public shooting opportunities (ranges). Since Jeff took over range development and maintenance, shooting opportunities have continued to expand across the state. As illustrated above, he has enhanced current ranges to improve shooting opportunity and developed new sites for shooters to enjoy in areas where no public shooting opportunity existed before. If you were to measure success simply based on his body of work, Jeff has truly enhanced the Hunter Education Section and its mission through his development of shooting ranges. Jocassee Gorges field office dedicated in honor of 'living legend' biologist Sam Stokes Sr.
Sunflowers decorate acres of Draper WMA in York Co.